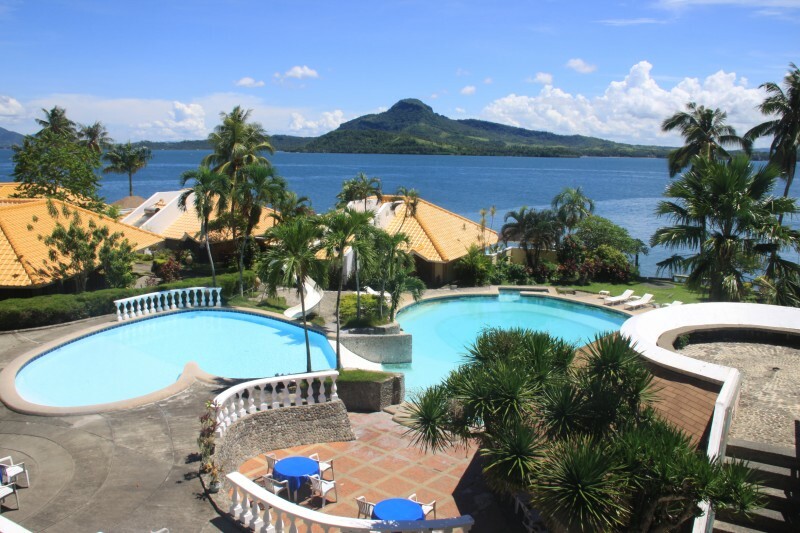 Leyte Park Hotel (LPH) is a paradisical hotel and convention center on a six hectare parkland nestled on a hill overlooking the beautiful views of Mount Danglay, San Juanico Strait, and San Pedro Bay in Tacloban City, Leyte. It exudes the distinctive luxury of a hotel and the ambiance of a resort. I went but did not stay here on July 18, 2013 at 10:13 a.m. This was during my first time in Leyte, the 21st province on my list. The Leyte Park Hotel was built in 1979, it is co-owned by the Privatization and Management Office (PMO) (34 percent), Province of Leyte (26 percent), and the Tourism Infrastructure and Economic Zone Authority [TIEZA] (40 percent), and was placed under lease agreement with UCI on September 15, 1994. Leyte Park Hotel has 48 rooms in the main building plus 52 cottages near the beach. The hotel features conference or banquet facilities that can accommodate up to 2,700 persons. Computer & Internet Services, Photocopy, Fax, etc. The Leyte Park Hotel is believed to be part of the ill-gotten wealth of the Marcos family. In 1987, the property was sequestered by the government under former President Corazon Aquino’s term. There is an ongoing legal battle between the Provincial Government of Leyte and the City Government regarding the auctioning of the government-owned hotel. About nine real properties of LPH are included in the supposed auction sale by City Government which covers 61,322 square meters. By air, Tacloban is 55 minutes from Manila and 20 minutes from Cebu. Leyte Park Hotel is conveniently located in the heart of Tacloban City, 15 minutes jeepney ride from Daniel Z. Romualdez Airport. Crucified Christ and the Map of Leyte Monument, People’s Center and Library, Santo Niño Shrine and Heritage Mueseum, Leyte Provincial Capitol, Balyuan Amphitheater, Cancabato Bay, San Juanico Bridge, Tacloban City Family Park, Diyo Island, Santo Niño Church, Kabalawan Island, Madonna of Japan, Tacloban City Hall, and MacArthur Landing Memorial Park.